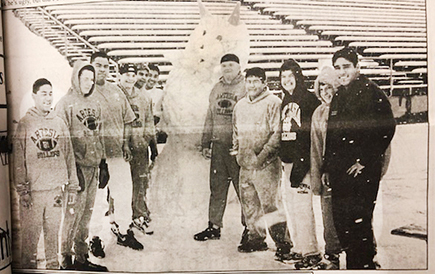 Looking back 40, 30 and 20 years ago, the following are excerpts from the Artesia Daily Press from Jan. 28 – Feb. 3. Pat Treybig has been named Carrier of the Year by the Daily Press. Treybig delivers to 112 subscribers and has been throwing papers for one year and five months. He has averaged only one complaint a month and has had all his money submitted to the circulation manager by the deadline each month. Treybig received a $25 saving bond and his name was engraved on a plaque that hangs in the Daily Press office. The Greenery, located at 208 W. Main Street, officially opened for business Friday after getting the ribbon-cutting treatment from the Artesia Chamber of Commerce. Owners John and Jeanne Waddell’s store features a complex line of indoor plants. As reported in the Pinon News: Oma Gage reports she lacks just a few days living in Pinon 60 years and this winter was the wettest we had seen in Pinon. Edith Atkins has lived in the mountain area 89 years, and she said there were more winter rains this year over the mountains than she remembered seeing. When she first came to the mountains there was a lot of snows. She remembers one family living west of Sacramento reporting they lived on potatoes three weeks one winter before they could get out to get groceries, then they tied pillows on their feet and walked out on frozen ground. Wednesday night of last week, it rained all night and the ground was very wet and still is. In the Cloudcroft area it was snow. “The Cheap Detective” was the featured movie of the week at the Landsun Theatre and “The Norseman” and “Our Winning Season” were the featured movies at Hermosa Drive-In. One Artesia farmer plans to stay in Washington, D.C., when the American Agricultural Movement begins its rally Monday, while two others have left a tractorcade to take care of business at home. David Menefee is staying with the tractorcade and the one tractor from the Pecos Valley, according to an AAM spokesman. Two other area farmers who made the trek by tractor from Amarillo to just outside Washington – Robert Johnson and Bernis Bratcher – have left to return to Artesia. Farmers are hoping to take their tractors into the nation’s capital early Monday morning to begin pressing their demands for full implementation of the 1977 farm bill. For the second in time in less than a year, Artesia High School is looking for a new head football coach. Barry Coffman, who was hired last spring following a two-month search for a coach to replace T.W. Harvey, turned in a letter of resignation Thursday to Artesia school officials. In the letter, Coffman cited personal reasons for offering his resignation. He added that he would like to be considered if any coaching positions a Park Junior High School or Zia Intermediate School become available. Coffman said today he had been considering resigning for a long time. As reported in the Pinon News: Drew Goslin walked the Pinon Water User’s water line the past week with a leak detector and found leaks that were unknown. Several persons have remarked about how much they appreciated Drew’s help. Pat Ramsey, owner of the pinon Ranch, was here several days the past week and got the well fixed at the ranch headquarters. But the lines are frozen so they do not have water at the houses. There are a number of persons wishing winter was past. “Oliver & Company” and “Dirty Rotten Scoundrels” were the featured movies of the week at Cinema Twin. “This is the hardest job I have ever loved; the challenges here just never end; and no two days are alike – but this is part of what makes the job so exciting.” The words are those of Artesia Chamber of Commerce executive director Dave Malkowski, who recently completed his first year in the job. Three Artesia youngsters claimed first-place trophies following competition last Saturday in the Elks District Hoop Shoot at Carlsbad High School. The three – all boys – won their respective divisions. Charles Maupin won the boys 8-9-year-old title by making 17 of his 25 free throws. His brother, Paul Maupin, clinched the 10-1- year-old boys title by making 19 of 25. And Cord Wilburn, the grizzled veteran, sand 23 of 25 free throws to win the boys 12-13-year-old competition. All systems are go for the new Veterans Administration Outpatient Rural Health Clinic in Artesia to start seeing patients March 20. Not even falling snow and low temperatures could keep Artesia and Lovington from squaring off. At the Pit, Friday night, the Bulldogs hosted the Wildcats, in what was the Bulldogs’ second district game, in front of a great Big Orange crowd. With every basket and defensive maneuver by the Bulldogs, the fans were cheering with everything they had. And pity the referee that waited until late in the second half before giving Artesia a deserved call, the fans seemed ready to come out of the stands and onto the floor so they could hang the man from the rafters right there. Despite some intense, hard-hitting play by the Bulldogs in the final period, Lovington was able to do just a little bit more, a few more of their balls were lucky enough to fall in their favor and they were able to go home with a 84-76 win over the Bulldogs. As reported in the Pinon News: Mr. and Mrs. Allen Henry came from Cloudcroft Wednesday morning and visited Mrs. Oza Holcomb. They brought Mrs. Holcomb a typewriter so she could have one writing the Pinon News, and stayed and visited a while and Mr. Holcomb enjoyed them so much. Two new faces will join the Artesia Board of Education at its meeting in March. In Tuesday’s board election, Lorraine Spradling defeated incumbent Carolyn Shearman, 191-167 in District 3. In District 5, Nancy Garay-Frescas beat Jeff Bowman, 294-157. Garay-Frescas will fill the seat now held by Daniel Reyes, who chose not to seek re-election. The Arteisa Lady Dogs started the night at the Pit, and their district season, with a win over the Tucumcari Lady Rattlers, as they sent the Tucumcari girls home defeated, 39-32.